The original deadline for entering the Web Marketing Association’s 14th annual WebAward competition is today, May 25, 2010. We will be extending the deadline to enter the 2010 WebAward competition without a late fee until this Friday, May 28th. Any sites submitted after this date will be subject to a late fee. The final deadline to enter will be June 15th, right before the judges receive the sites. No sites will be accepted after this date. For complete information on how to enter, go to www.webaward.org. WebAwards deadline only days away! If you are like most Internet professionals, you have already entered the 2010 WebAward competition for website development. If you have not done so yet, what are you waiting for? There is only one week – 7 days – less than 168 hours – to earn the recognition that will get you noticed. You’ve waited long enough, it’s time to enter. You don’t want your CEO coming to you in September and asking why your competitor won one of those cool new WebAward trophies and have to tell him or her that you missed the deadline! With 96 industries participating, of course there is a category for you. The 14th Annual WebAward competition deadline for entry is May 25th, right before the Memorial Day Holiday in the USA. Entering is easy. Simply create a nominator account or log into an existing account from past years. This password protected area will allow you to enter multiple sites, edit the information and receive updates, results and feedback on your entries throughout the competition. Avoid a late fee by completing your Web sites entries before the deadline. If you have already submitted your site, please make sure the entry is complete, the URL is active and any entries fees due have been paid before the deadline so the entry can be submitted to the judges. Want to know how to increase your chances of winning a WebAward? Become a Fan of the WebAward Page on Facebook. Each day a new tip is posted to give you better insight into how to best position your entry to give it the maximum impact with the judges. The Web Marketing Association is offer tips to improve your chances at winning a 2010 WebAward on the WMA Facebook Fan Page every weekday for until the May 25th entry deadline. WebAward Tip #6 – Selecting the Most Appropriate category. The best way to pick the category your site will compete in is by saying to yourself “What would be best for my marketing program if I win?”. Many categories overlap because over the years people complained that they were one and not the other. The other thing to consider is how competitive the category might be. The “Mutual Fund” category is narrower than the “Financial Services” category and might be easier to take the top prize. However, Best Financial Services Website might have more cache for your marketing efforts. Sometimes the best idea is to enter both categories and double your chances to win. WebAward Tip #7 – Tell Your Other Offices. One of the most prestigious awards given out each year is the Top Agency award, given to the agency which wins the most awards in a given year. If your agency has multiple offices or international offices, make sure they submit their entries also. We will combine all offices of the same company to count for that award. WebAward Tip #8 – Non-English sites Are Welcome! The international WebAwards accepts sites in 10 languages (English, Spanish, French, Italian, Russian, Dutch, Chinese, Japanese, Greek and Turkish) and assigns these sites to judges who are fluent in that language. However, if an English version of the site is available, please submit that site as we have many more English speaking judges that other languages. WebAward Tip #9 – Don’t Forget Microsites. It’s not just major enterprise websites that win awards. Sometimes it is the microsite, a site dedicated to a single product or concept, that does very well. It all starts with the URL you submit on the entry form. WebAward Tip #10 – It’s Not Just The Big Names That Win. We pride ourselves for having a fair competition where it’s not only big brands that win. Judges are assigned sites to review without knowing who else might be in the category. Other website award programs have a history of sending only “big name” sites judges as nominated sites. At the WebAwards, the judges review all of the sites and the one with the highest scores wins. WebAward Tip #11 – Enter The Same Site Every Year. Your site does not have to be new to enter the WebAwards each year. As Internet standards change, judges view sites differently and criteria scores can be different year over year. It’s a great way to benchmark your site and know what areas need to be improved over time. WebAward Tip #12 – The URL You Enter Is Our Starting Point. Judges start their review based on the URL provided on the entry form, so you can submit sections of an overall website, not just the homepage. This is helpful when one division or product line has great content and wants to promote itself, but the site is part of a larger organization. WebAward Tip #13 – Blog About The WebAwards. The more people know about the WebAwards, the more impressed they will be when they hear you have won one. Please help us by blogging about the WebAwards and sending people to www.webaward.org to learn more. WebAward Tip #14 – Don’t Enter A Banner Ad. Each year several banner ad campaigns are entered the WebAwards and the nominators are always disappointed that they do not win because they don’t have meet the requirements of a website. Banner ads belong in the annual IAC Awards, not the WebAwards. WebAward Tip #15 – Don’t Enter A Landing Page. Each year landing pages are entered the WebAwards and rarely do they win awards. Landing pages usually are missing several key elements of a complete website and they are better suited to the annual IAC Awards, not the WebAwards. Micro sites however, tend to do very well because of their narrow focus. 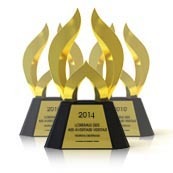 Click here to enter the 14th annual Web Marketing Association WebAwards. Let’s face it – every Website on the Internet is a “marketing Website”. Whether it is a company trying to sell a product to a customer or a 15 year old high school girl trying to sell herself to her friends on MySpace, Websites are designed to promote a brand, product, person, company or idea to a global audience. And it works and works well. The question is then how to transform your B2B or B2C Website to rise above the rest and be worthy of recognition. For almost a decade and a half, the Web Marketing Association has watched websites evolve and become important communication tools for marketing and commerce. Our WebAward competition for Website development has recorded more than 24,000 site reviews and recognized the best websites in 96 industries each year. Based on this award program research, here are four ways to make your website a more effective part of your online marketing efforts. Focus on Content – Content is what people come looking for on your site. While every sites is different, straight information often does not always cut it any more. Users expect much more when they come to a Website looking for product information. They want to see links to manuals, customer testimonials or ratings, and virtual demos. Content today needs to be entertaining as much as it is informative. As browsers go mobile, be sure your content is suitable for mobile browsers and consider special content just for mobile visitors. Make the Site Come Alive – People what to be entertained and use all of their senses when they come to a Website. The experience is what makes a lasting impression. Sound can be a powerful tool. I remember one WebAward winner that allowed you to click on difficult medical words to hear how they sound and to learn to pronounce them. Simple technology that provides a valuable experience can give a user the confidence needed to talk a medical provider on important personal issues. Appropriate use of Flash can also add much to a site. 73% of last year’s WebAward winning sites used Flash to enhance the user experience. Flash can enhance navigation and be used to create outstanding3D product demos for products and virtual tours for restaurants and hotel Websites. At the same time, overuse can make a sites seem cluttered and overwhelming. Personalize the Experience – Databases changed Websites from flat hard-coded html pages where everyone saw the same thing every time, to dynamic pages where everything is added on the fly based on the needs of the specific page at that time. This also allows Websites to know their customer better when they return. Amazon.com is a great example of this. Every time you return, you can see past searches and purchases as well as what other buyers of those products were interested in as well. Be careful that personalization does not become a barrier. Some Website make it hard for me to return by not remembering my username and password. Security feature? Not to me it isn’t. It’s bad customer service that will end up having me find another site. Yes you can target offers to me if you know who I am, but if all you do is target me, then I’m likely to know it and move on. Consistent Brand Experience – What consumers experience online should be complimentary to what you are trying to accomplish offline. All too often interactive developers loose focus of the brand intent when implementing the online brand strategy. Often silos between traditional advertising and interactive departments result in opportunities being missed. The Internet can help you target you brand messaging to a tighter audience, but the brand values must be consistent everywhere the consumer interacts with the brand. Websites today are too important as a branding and sales tool to not spend the effort to make sure that you stay on the cutting edge within their industry. Remember everything is relative when it comes to website development. It does not matter what Mercedes is doing on their Website – unless you are BMW. Focus on what your competitors are doing and make sure you keep the needs of the customer as priority one. This will help you stay one step ahead and make sure your efforts put you in good light when a potential customer is choosing between you and your competition. William Rice is President of the Web Marketing Association, sponsor of the annual international WebAward competition for Website development. Now in its 14th year, the annual international WebAwards competition sets the standard of excellence in 96 industry categories by evaluating Web sites and defining benchmarks based on the seven essential criteria of successful Web site development. The goal of the Web Marketing Association is to provide a forum to recognize the people and organizations responsible for developing some of the most effective Web sites on the Internet today. Entrants benefit from a Web site assessment by a professional judging panel and the marketing opportunities presented to an award-winning Web site. For more information, visit www.webaward.org. WebAward Tip #1 – Pay Attention to the Audience and Mission Statement The judges use the audience and mission statement to get a sense of what you are trying to accomplish. It puts things into perspective for them. If you are too vague or worst too long winded, the judges will go on what that think the goal of the site should be and it may not be what you expect. WebAward Tip #2 – Enter Early If You Pay By Check: Entries cannot be sent to the judges until the entry fee is paid. Some nominators wait until the final deadline to submit their site and then have to submit a check request! If your company requires you to pay by check, use May 1st as your deadline and get the site su…bmitted and the check request processed to give your entry viewed by the judges in the first round. WebAward Tip #3 – Don’t Have A Single Landing Page for All Entries. Some agencies like to have a single landing page for all entries submitted to an awards show. This might make things easy for them, but it can be a nightmare for the judges. Creating a landing page is acceptable as long as it is only for the entry under consideration. WebAward Tip #4 – Don’t Include Instructions In The URL Field. When we ask for a URL, we want only a URL. Typing “www.webaward.org (go to the bottom of the page first)”, will result in the judges getting an error message. If you have something you want the judges to know, add a “NOTE TO JUDGES” at the beginning of your audience and mission statement. WebAward Tip #5 – Check your URL and Passwords. Every year sites are disqualified because the nominator had a typo in the URL or the server moved or the username expired. Don’t let this happen to you! If the URL changes, email us and we will update it. Make sure the user name and password (if necessary) are valid until… August 15th to be sure the judges can access the site. For more information on the 14th annual WebAward Competition for Website development, please go to www.WebAward.org. Congratulations to Karen McFee of Mediasmith who won the free full-conference pass to the Ypulse Youth Marketing Mashup in San Francisco Mat 21 & 22 at the Hotel Nikko. There is still time to register at http://mashup.ypulse.com/. Use the code “WMA” can be used for a 10% discount for this event.